More than 30 people came together last Saturday for the eighth annual Orangeville WALK-IT for Parkinson’s at the Alder Recreation Centre, raising $10,107, with more coming at the end of the month, for people suffering with the debilitating disease. The event has been growing since its start in 2012, and has now raised over $100,000 in Orangeville. 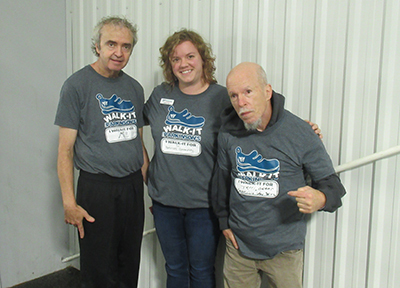 Hosted by the Parkinson Society Southwestern Ontario, the event, with 16 walks in the region, is the organization’s largest fundraiser of the year, with participants walking between one and five kilometres. Parkinson’s is the second most common neurodegenerative disorder after Alzheimer’s disease. It is a slow, progressive disease resulting from the loss of dopamine (a chemical messenger) in a part of the brain called the substantia nigra. Parkinson’s causes nerve cells in this part of the brain to become impaired or to die. This lack of dopamine results in the adverse motor and non-motor symptoms of Parkinson’s. There is no single known cause for the development of Parkinson’s, although research points towards hereditary and environmental contributions. Primary symptoms associated with the disease include tremors, rigidness, slow movement, postural instability, and loss of balance control, soft speech and sleep disturbances. Currently, there is no cure for Parkinson’s. In Canada, approximately 100,000 people have the disease, with 10,000 of them in Southwestern Ontario. He added he is part of a local support group, and “everybody is at their own stage,” with Parkinson’s, with members varying in age and how long they have been dealing with the disease. For more information on Parkinson Society Southwestern Ontario, visit parkinsonsociety.ca.